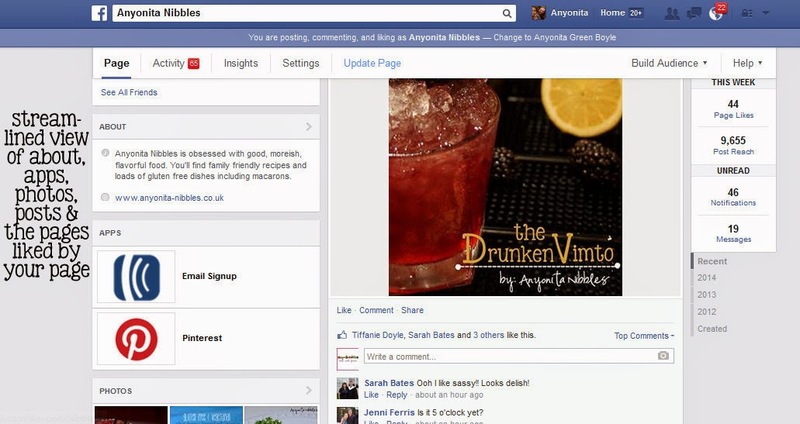 In an attempt to revamp and shake up things, Facebook has begun rolling out a new page layout. Come June 13, this layout will be mandatory and whether you want it or, your page will be converted over. Between now and then, however, you can update to the new layout. You can also choose to update only the page from your point of view, leaving your followers to view the old style. With the new Facebook page layout, you can expect a more streamlined appearance, an emphasis on purchasing ads and sponsored posts and, surprisingly, an emphasis on your own content! The new layout mimics that of the timeline layout and makes it look more cohesive and user-friendly. Because it now looks more like what people are used to, I think it'll encourage greater interaction; it no longer looks like a completely different website from the timeline. This is the layout of the page with a bigger, more prominent cover photo. A visible category beneath your page name, so make sure this accurately reflects what type of page you have. There's a new toolbar that emphasizes analytics, sponsored posts and building your audience. On the right, there's a swanky new sidebar feature that quickly calculates your stats in real time every time you log in. You can see at a glance how your posts are performing for the week and the number of new likes you've received. The left side of the page has become a streamlined view of the elements that were at the top of the old style page. You'll find your apps here, a grid of the photos you've shared recently on your page, the posts made by others and the names of pages you have liked while using Facebook as your page. This closer look at the photos box on the left sidebar reveals why it's going to be important that you're sharing high quality, beautiful photographs. Try to share Pinterest-standard photos on your Facebook page to maximize the functionality of this box and to draw attention from page viewers. Take notice, the page does not pull thumbnails from link or page shares. Only photos you have manually uploaded. Below the photos is where you'll find all of the posts other people have made on your page. This left sidebar is suddenly very busy and is meant to provide a quick way for pageowners to get an overview of the activity on their pages without having to hunt and dig around for it. Use it to your advantage. At the very bottom, you'll find the list of pages that your page has liked. I'm not sure why Facebook thought this was important. Other than an acknowledgment that many pageowners were upset about content from pages not showing up in their timelines. Otherwise, I think this is pointless. Remember how I advised you use the left sidebar to your advantage? Facebook has kindly given you control of your own page! (For once!) You can drag and drop each element to determine the order it is shown on your page! Don't get too excited, though; as always they're going for overarching uniformity and you cannot add new elements nor can you remove any of the elements. But at least you could prioritize and optimize your sidebar. Every other month there seems to be a new trick for how to manipulate Facebook into sharing your content with your followers. This information is always changing because Facebook is constantly rejigging its algorithm off the basis of research it performs around the clock. Here are the latest methods everybody's talking about for getting your posts viewed. I've tested them all and will show you in numbers the best options. This is what a sponsored post looks like. You can see at a glance the number of people the post reached and if you click the tab on the right, you can see an in depth analysis of the sponsored post. Sponsored posts gives you the flexibility and control to really pinpoint a particular demographic of Facebook users. You'll also be in control over how much you spend. Facebook will suggest an amount, and you can choose to spend less or more, depending on the reach you want. This method will only be applied to the posts that you choose. If you want five posts boosted, you'll have to pay for each of them. 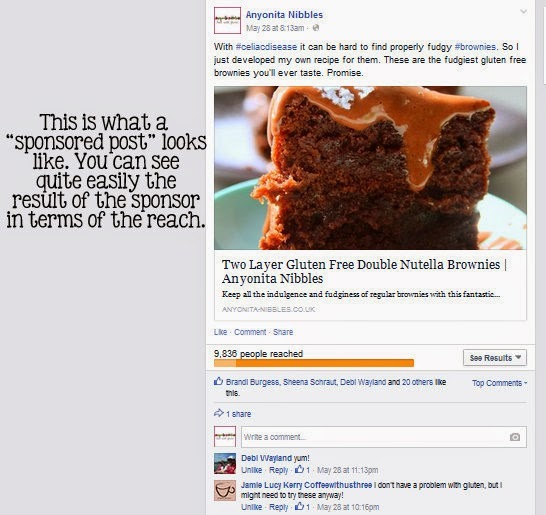 If you want your entire page boosted, you'll have to purchase a traditional Facebook ad. Or get another blogger or fan to do a page share. Doing a page share has a become a popular way for bloggers to get their post views up and to get people talking about their pages. 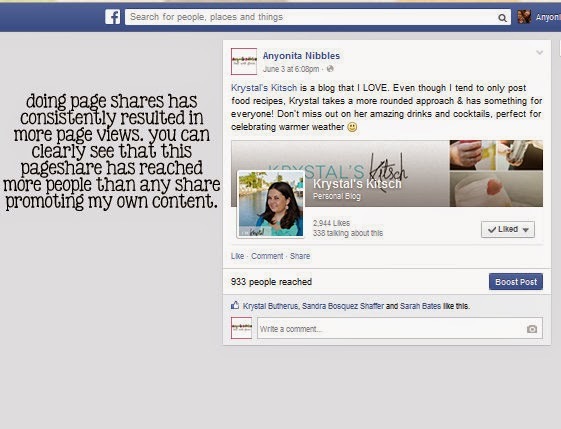 When I do a page share, the number of people reached is instantly increased for that particular post. The pages I've shared also often report back that they've noticed they've received more likes, so it's a nice trade off for all parties involved. The question is when is Facebook going to catch on and start treating page shares with the same level of restriction they treat other posts with? In one of the blogging groups I run, (Blogger SOS a place for bloggers to ask one another questions about anything relating to blogging--click that link and ask for an invite!) 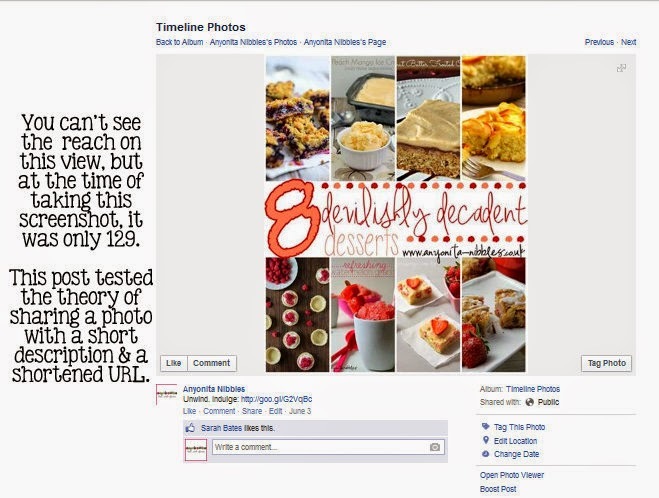 someone mentioned that another popular food blogger had disclosed a method for getting more post views on Facebook. I'm dubbing it the short and sweet method. You keep the description short and insert a shortened URL and you manually upload a photo. Allegedly, this method is supposed to result in loads of post views. My reach for a post I did in this method was just 129. Another post I did using the short and sweet method only reached just over 200. 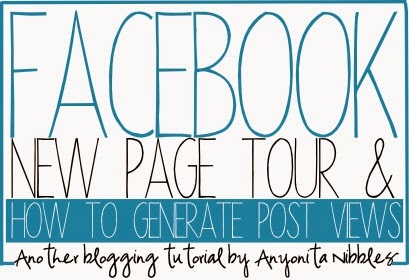 For me, this isn't a method that generates a lot of post views, so I won't be using it again. But because everyone's followers are different and spans different demographics, this type of post might be the thing that your followers relate to. You won't know until you try it. You might remember a few months ago, I wrote a blog post detailing what Facebook said is the best way to share content on Facebook. Well, for me, it's still the best. Aside from buying post views through sponsored posts, sharing on Facebook this way consistently garners a decent number of post views. It's not in the thousands, but I don't think Facebook will be letting anyone's reach go that high unless you pay. Going forward, this is the way I'm going to share my content. It's head and shoulders above the other methods. The important thing to remember when it comes to Facebook is that your followers aren't my followers. People use Facebook differently and different people are more receptive to different forms of content sharing. Use these methods as a guideline. Try each one over a course of a few weeks and determine which is the best for your followers and make that your best practice method. Thanks Anyonita. Great info. I've pinned it for later. I know I'm going to need it. I haven't "jumped the shark yet". More great info, from you Anyonita. Thanks for your insight and sharing your research and knowledge with the rest of us; great job! I started doing it FB's preferred way after your last article and it seems to be the way that works best for me. I also think it looks nicer. I don't like the "link in the comments" method because it's an extra sentence to read, an extra click, and doesn't display as nicely. Plus I don't even think it works better. So I'll be sticking with this method, though you've now got me interested in maybe doing a sponsored post. Yes, it's really about finding what works best for your page and your followers. 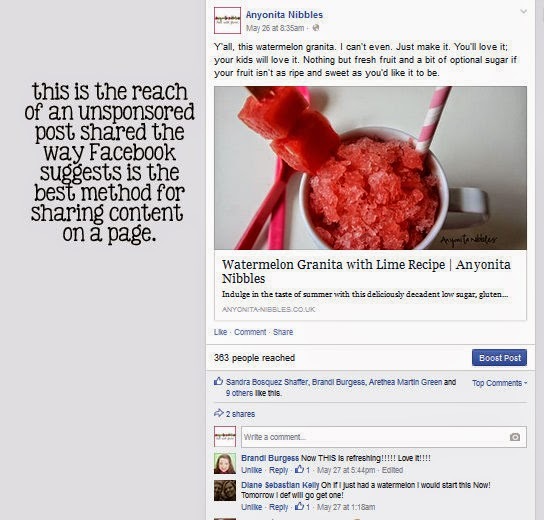 :) You can still do a sponsored post even if you share FB's preferred way, by the way.